Come out and support 7 bands of our adult rockers as they showcase the songs they will write during a 6-week crash course in making a band! They are all working so hard & being so brave, and they deserve the best audience the Soda City can bring! Our bands are all fundraising independently, so show your support by donating to their individual campaigns. The band who raises the most money for our programming will win a four-hour recording session at The Jam Room music studio with local sound wizard Zac Thomas. The Long Con - We are so happy to have a new edition to the local music scene joining the line-up. Long-time volunteer to many Girls Rock organizations, Ony Ratsimbaharison, will share her newest musical project with us alongside fellow musicians Nicolasa, Gabe & Preston. 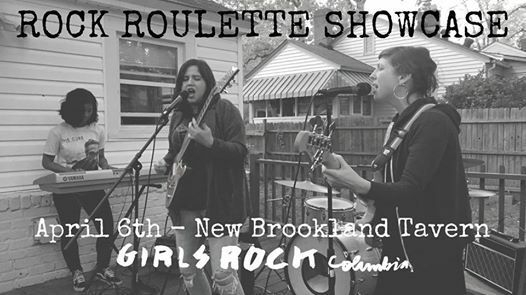 Tickets are $10 at the door and will be available for pre-order through New Brookland Tavern. Doors at 8PM, show starts promptly at 9PM.